In order to understand the resilience of capitalism as a mode of production, social organization, and an intellectual system, it is necessary to explore its intellectual development and underlying structure. A Historical Political Economy of Capitalism argues that capitalism is based on a dominant intellectuality: a metaphysics. It proposes the construction of a history-based 'critique of political economy', capable of revealing the poverty of capitalism's intellectual logic and of its application in practice. This involves a reconsideration of several classical thinkers, including Smith, Marx, Berkeley, Locke, Hobbes, Hume and Rousseau. 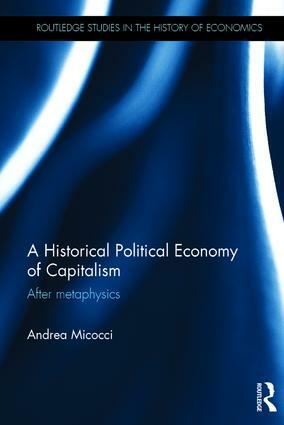 It also sketches an emancipative methodology of analysis, aiming to expose any metaphysics, capitalist or none. In doing so, this book proposes a completely new approach in materialist philosophy. The new methodology in political economy that is proposed in this volume is an alternative way to organize a materialist approach. Some basic aspects of what is argued by the author can be found in Marx. This book is well suited for those who study political economy and economic theory and philosophy, as well as those who are interested in Marxism. Andrea Micocci is Professore Straordinario of Political Economy, Link Campus University, Rome, Italy.